Does it count as Play in Nature if you are eating it? I think not but here I go! Everywhere I go I look for amazing food. Usually (since I am drawn to coastal areas with turquoise water) I am looking for the best oysters around. Oysters can be VERY expensive so I am also looking for inexpensive oysters too. I always ask the locals where they buy fresh seafood, where they eat seafood and what other tips they might have. I have found that the Concierge at the hotels will send you to places that are expensive and touristy. RARELY do they tell me where the locals eat. My husband and I went to Hilton Head, South Carolina and used it as our home base for travel to Savannah and Charleston. Every day in Hilton Head we asked where locals got fresh oysters. 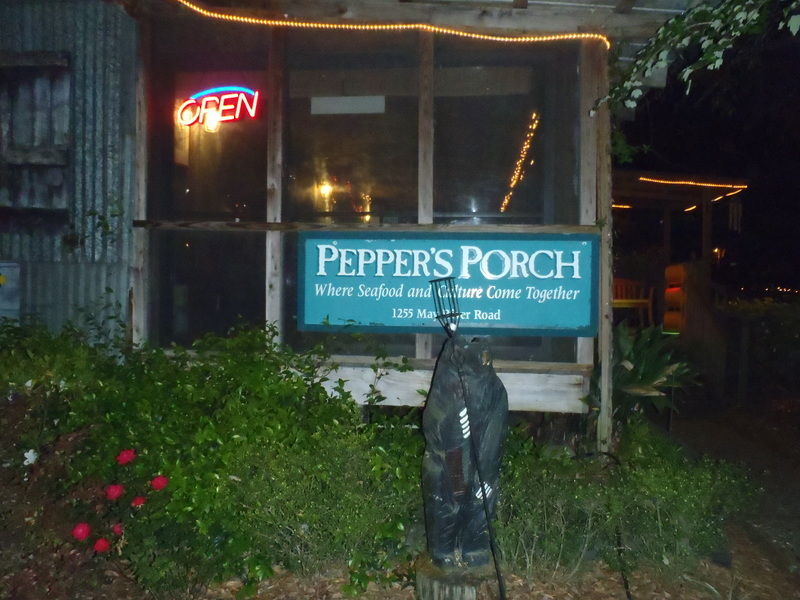 Several people sent us to Pepper’s Porch. 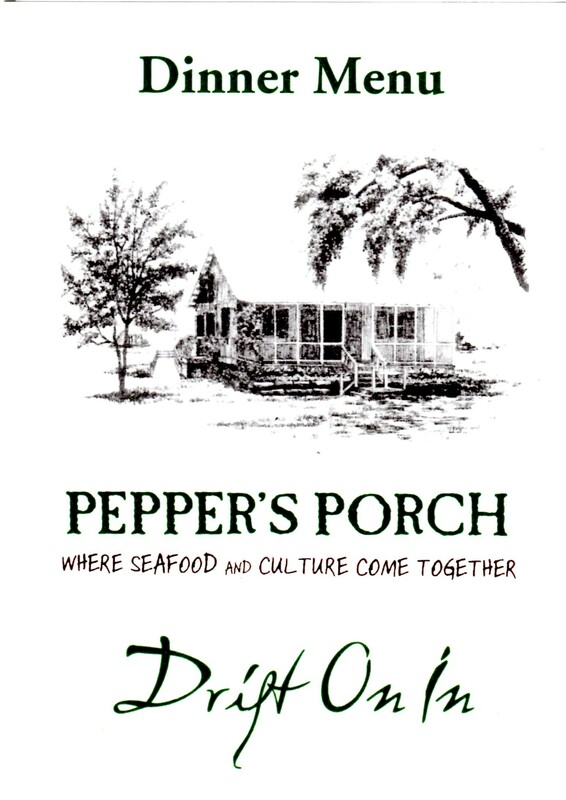 And I have to say Pepper’s Porch is one of the FINEST resturants I have ever eaten at! For a measly $13.95 we got a half BUCKET of steamed oysters. We did have to open them ourselves but that was half the fun! It is easy and entertaining to open your own oysters. For dessert we had FRIED STRAWBERRIES! OMG! Can you smell the chocolate? I can. 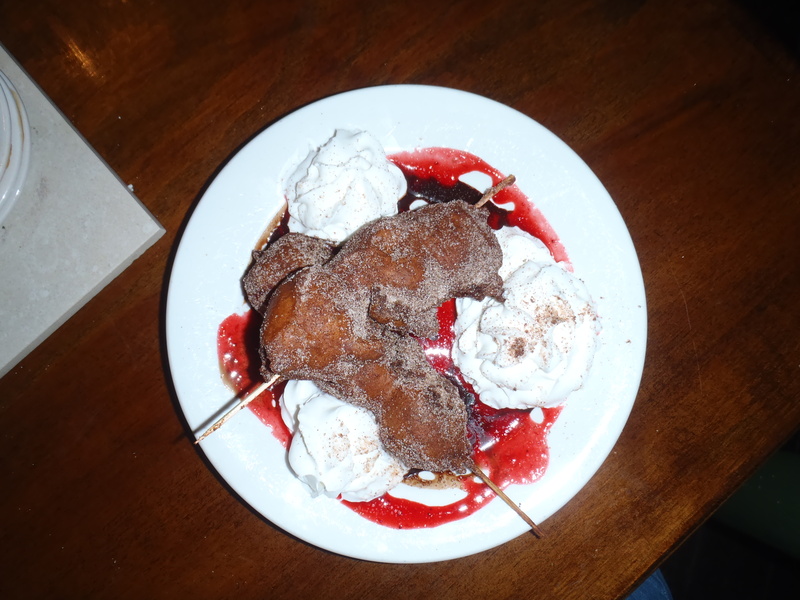 FRIED strawberries, drizzled with chocolate and powedered sugar! I thought I had died and gone to heaven. REALLY. I am usually a savory dessert eater. This one was just sour enough to make me LOVE it. If you are EVER in the area don’t forget the FRIED strawberries for dessert. I honestly can’t remember what we had for dinner. I am sure we ate dinner but for the life of me can’t remember WHAT it was! So I am recommending what stands out now almost a year later. The other thing that stands out is the ambiance. 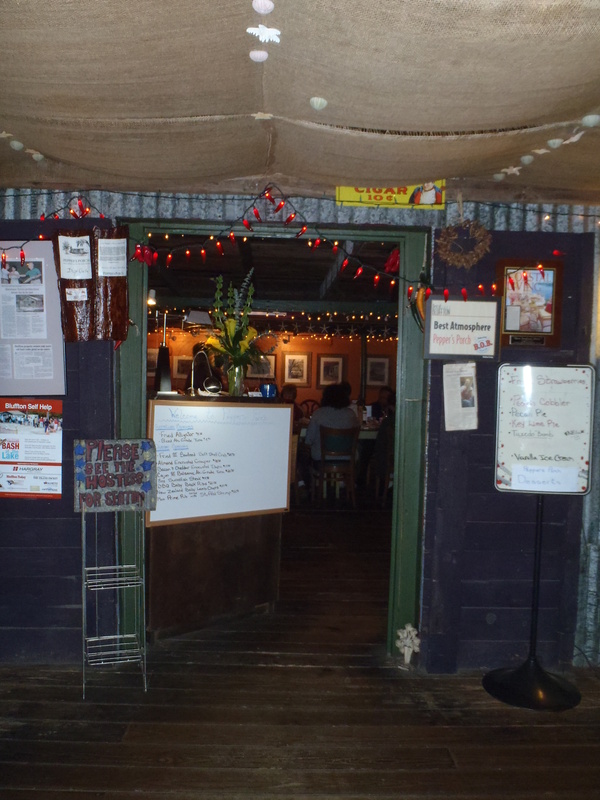 This was the most lovely resturant. GREAT staff, welcoming folks, nice, helpful and FRIENDLY! We wondered where all those fabulous oysters came from and were told that they could be found down the road at the Bluffton Oyster Company. So on out way out of Hilton Head on our way to my friend Julie’s in Atlanta (she writes 3pupsinapopup.com ) we stopped and got a bag of oysters and a few pounds of shrimp for dinner at her house. I have to tell you that the last time I was there with my friend Bertha we went to the grocery store to buy wine (what else!) and there was a guy there coming out of the store with a case of beer and APPARENTLY a bag of shrimp in his pocket and he was dropping them on the ground. Which caused us girls (think the tune of pants on the ground from Idol) to write our own song. Shrimps on the ground, shrimps on the ground. Got your case of beer but your shrimps on the ground! And of course all three of us were laughing hysterically. NOW ………back to the story at hand. We had a fabulous dinner at Julies house and then we headed back north to Illinois. WHAT a wonderful trip, what great food and what amazing finds. 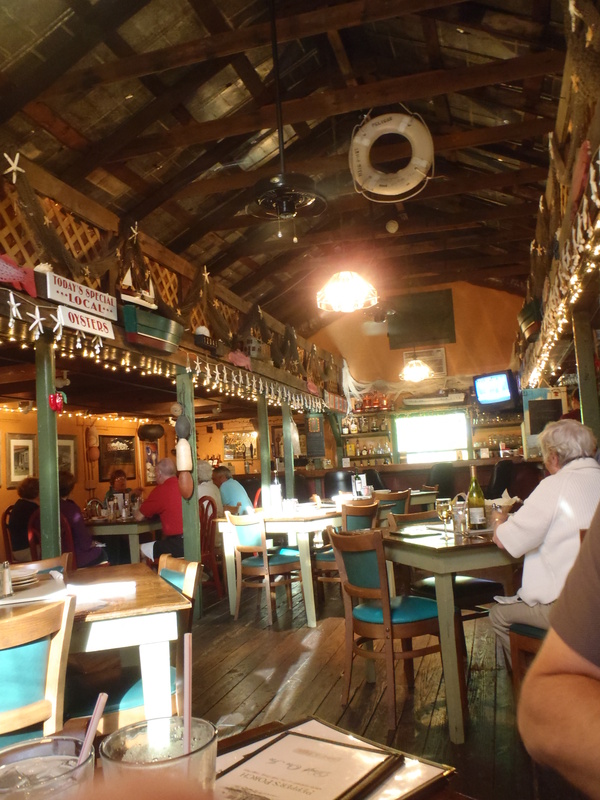 My next installment will be about our trip to Savannah to find my dream food at Paula Deen’s! This entry was posted in Uncategorized and tagged 3pupsinapopup, Atlanta, bluffton oyster company, bluffton south carolina, foodie, foodies, fried strawberries, hilton head, historic bluffton, Illinois, julie fredrick, Oyster, oysters, Paula Deen, peppers porch, raw oysters, Shellfish, South Carolina, travel food, travel with children, traveling, United States. Bookmark the permalink.